On August 4, 2018, State Councilor and Foreign Minister Wang Yi met with Foreign Minister Don Pramudwinai of Thailand on the sidelines of the Foreign Ministers' Meetings on East Asia Cooperation in Singapore. Wang Yi expressed that China-Thailand relations have enjoyed a sound development momentum since this year, with rapid growth in bilateral trade and investment. The Chinese side is willing to make joint efforts with the Thai side to push forward the construction of the China-Thailand railway and the Eastern Economic Corridor in Thailand as well as other major projects in the process of the joint construction of the Belt and Road Initiative. Wang Yi expressed that the tour boat overturning accident occurred in Thailand's Phuket last month was a tragedy. The Thai government had carried out search and rescue work with all strength. It is hoped that the Thai side will continue to well arrange for the follow-up matters. The two sides should strengthen cooperation in tourism safety to prevent reoccurrence of similar accidents. Don Pramudwinai expressed his deep sorrow and condolences over the tour boat overturning accident in Phuket again, and noted that the Thai side attaches great importance to investigations and the follow-up matters and will take practical actions to well arrange them, so as to ensure the safety of Chinese tourists and enable the sustained development of tourism cooperation between Thailand and China. Don Pramudwinai also thanked the Chinese side's assistance in rescuing a youth football team from a limestone cave in northern Thailand. 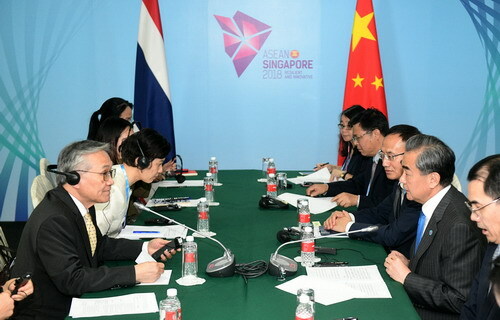 Don Pramudwinai noted that the Thai side hopes to maintain high-level exchanges with the Chinese side, actively participate in the China International Import Expo, further strengthen economic and trade cooperation between both countries, and continue to advance the cooperation under the Belt and Road Initiative, including the construction of Thailand-China railway.